Acrolite aircraft was formed about ten years ago by four guys that just love to fly and love to be creative and build things even more. We all have jobs and families to support so this is all done in our spare time with any resources we can scrounge up. Acrolite aircraft does not make any money, we all do what we can with what we have to see our projects through to completion. Presently we have five aircraft flying, one almost completed and two more on the drawing board. It is almost a full time job keeping them all airworthy. 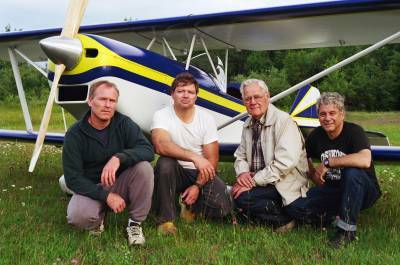 We could not do this without the support of our families and friends and the members of the Kakabeka Falls Flying Club. Our old partner Vern passed away on Wednesday Sept. 5, 2001. He was working on the new triplane, sat down in the old chair he had in the shop for a short rest and never got up. It appears to have been a heart attack. We will miss the old guy as he was a good friend, a constant advisor and the heart of many of our building projects. A carpenter and cabinet maker for most of his life he was a craftsman in the true sense of the word. The reason the planes came out so well was due mostly to his efforts. Vern did the wooden wings, the fiberglas cowls, the top cowl and the turtle deck on all of the biplanes. He did much of the design and layout work on the new triplane wings. 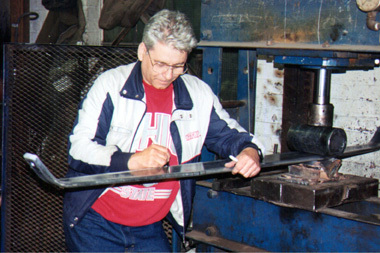 Even when his health was bad he was still out in his shop doing all he could on the many projects he had on the go. A grand man, we are diminished by his passing. This is the original Acrolite biplane and a forerunner of the present Acrolite. This aircraft was designed in 1985 to take full advantage of the regulations governing ultralight aircraft in Canada at that time. Construction was started in January 1986 by Peter Eisenbach and Chris Weiher and the first flight was in October 1986. It was a 22 foot span biplane with a empty weight of 281 lbs. and powered by a Rotax 440 engine. It is an excellent flying machine that is still being flown today. Several years ago Aircraft Spruce and Specialty Co. announced its sponsorship of an aircraft design contest that had as its goal the development of new homebuilt aircraft that could easily be built from scratch, from plans and/or building instructions and commonly available raw materials. Not everyone can afford a kit, so the contest was intended to produce interesting new aircraft that could be built as customers could afford to purchase materials. The Design competition began as a paper exercise, with drawings of the design being evaluated with the winner being announced at EAA's Oshkosh 95: Ron Wilson's entry-level aerobatics biplane, the Acrolite®. The completed Acrolite® made it to the 96 Convention and was showcased throughout the week in Aircraft Spruce and Specialty CO's outdoor display area adjacent to the new North Exhibit Hangar. The Acrolite® is a biplane that can be fabricated either as a scratch-build project or from a series of entirely compete material and hardware kits available from Aircraft Spruce and Specialty Co. The complete airframe kit can be ordered for under US$8000 not including engine. Thank you for visiting our website. We hope you enjoyed seeing our building and flying projects as much as we have enjoyed creating them. If you are ever in the Thunder Bay ON area stop by for a visit and have a look at our projects.